Give your family room the ultimate storage and style centerpiece with this lift-top cocktail table. Stylish details like the modern dark finish, sleek metal knobs, and transitional design perfectly mask this storage haven. A lift-top reveals three storage compartments, two shallow shelves for books and remotes along with a deeper center trunk space for games, blankets, and more! 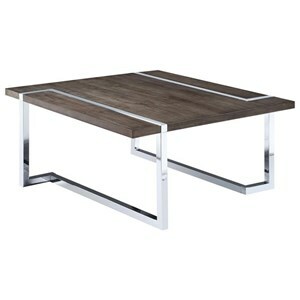 Fill this coffee table with all your living room necessities while leaving the space looking fabulously modern. 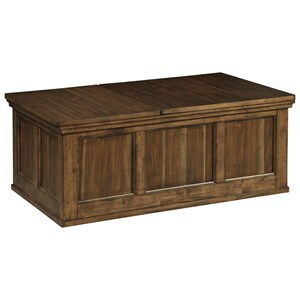 The Ventura Lift-Top Cocktail Table with Side Storage Drawers by New Classic at Beck's Furniture in the Sacramento, Rancho Cordova, Roseville, California area. Product availability may vary. Contact us for the most current availability on this product. Modern styling with classic moulded accents give this transitional group a timeless look. Fit your living or family room with these pieces for a rich accent. A deep brown finish is combined with subtle moulding, metal hardware, tapered legs, and straight lines to create this transitional group. The Ventura collection is a great option if you are looking for Transitional furniture in the Sacramento, Rancho Cordova, Roseville, California area. Browse other items in the Ventura collection from Beck's Furniture in the Sacramento, Rancho Cordova, Roseville, California area.